“Girl’s In The Band” marks perpetual 10-year-old boy Nancy Cartwright’s first ever foray into writing for the series that’s been her home and defining achievement for the past 30 years. 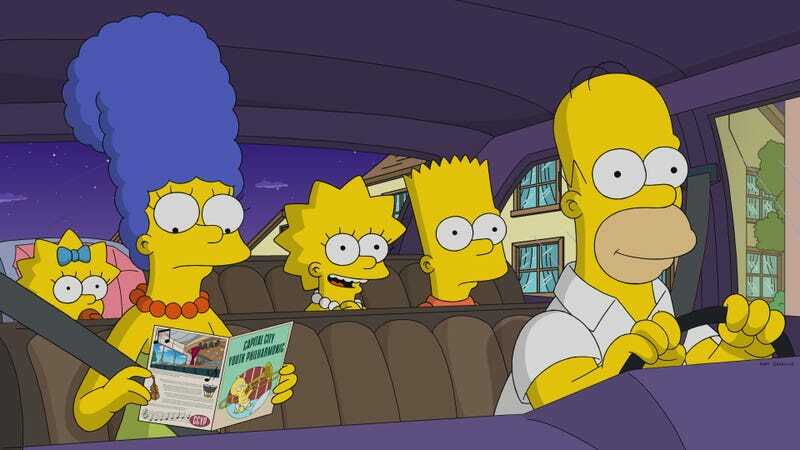 Joining Harry Shearer (who wrote one in season 28), and Dan Castellaneta (whose written nine, usually alongside life and writing partner Deb Lacusta), Cartwright’s late-run entry into the Simpsons writing canon isn’t a Bart story, per se. 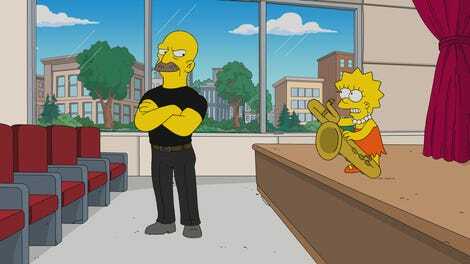 Instead, it’s one of the show’s many examinations of how Lisa’s multifaceted exceptionalism winds up putting the family into a bind, as Lisa’s saxophone skills send her on an expensive, time-consuming daily gig with the Capital City Philharmonic’s youth division. That’s a minor structural quibble about an episode with a much more glaring storytelling problem, though. Working through a conflict on The Simpsons is a lot harder than it looks. We have to start at one and return to one, all in 20-odd minutes, and all in a world that can never fundamentally change. So the conflict here means Lisa and her family each have to come to terms with a seemingly insoluble problem, all while staying true to each character, and not short-changing anyone in the necessary resolution. It’s harder, I maintain, on a show like this than on a more conventionally serialized show, where arcs can affect the whole in a more permanent way going forward. Still, a great episode of The Simpsons finds a way to do that—including at least one other episode where Homer takes a second job to make his daughter’s dreams come true. Not to hold this iteration of The Simpsons to that high a bar, but, then again, why shouldn’t we? “Girl’s In The Band” isn’t a bad effort at finding that narrative and comedic sweet spot that made The Simpsons The Simpsons—but it’s an incomplete and unsatisfying one. This isn’t to gloss over the fact that Lisa’s chance to join the Philharmonic career path is an easy choice for her parents to make. It’s that the episode glosses over the fact that there needs to be a more resonant way in which to show how an all-too-common family no-win situation can provide a satisfying episode of The Simpsons. When finally Lisa gave up her horse, Marge treated her like an adult, showing her daughter how our individual dreams affect the people we love, and allowing her to make a choice. That’s why Lisa’s goodbye to Princess breaks our hearts—it’s a moment where a little girl realizes that life is all about making compromises and sacrifices for people we care about, even if they are such screw-ups that their grand gestures are what cause us more heartbreak in the end. In its place here, the inciting incident is Lisa overhearing Marge moping to Bart, “There’s nothing worse than being a parent of a kid with promise,” and I simply have no idea who that Marge Simpson is, frankly. Here, Lisa makes a choice, too, intentionally playing a wrong note so that Klesko boots her back to Springfield. (More specifically, to the corner of “Good-But-Not-Great and Disappointment Boulevard.”) And I really liked the way that Cartwright left things, with Bart and Lisa bonding over the shared knowledge of Lisa’s act in a giggling conspiracy of backseat Homer-baiting. If anyone knows the Simpson kids at this point, Cartwright does, and to let Bart and Lisa respond to a grown-up problem by acting like the very real kids they still are works nicely. It’s sweet, and sad in its way, but “The Girl’s In The Band” can’t unify those elements into something truly satisfying. Bart’s chalkboard reads “I am not a grandmother.” Cartwright’s a grandmother. Simmons is always a treat. I especially liked how Klesko’s attempt to frighten Lisa lists all the secret notes bigger kids have to learn: V, cursive-V, Frank, Frank-natural. Maggie remains the show’s real secret genius, of course, showing Lisa a forgiveness picture of her big sister holding an all-A report card and a note reading “You are Lisa Simpson.” Which is from another episode that dealt with this particular parent-child disillusionment theme a whole lot better, too.